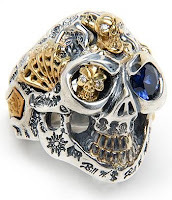 A very intricate and colorful skull ring from Bill Wall Leather (BWL); part of their Lucky MoFo line. Retails for $3,500. If you are a biker jewelry aficionado and price is not your biggest concern, then you will want a couple of BWL pieces in your collection. 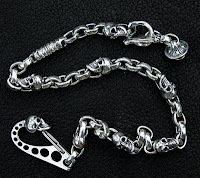 Heavy wallet chain from BWL. Retails for $2,350.